Roasted on a bed of fennel, carrots, onion and shallots. 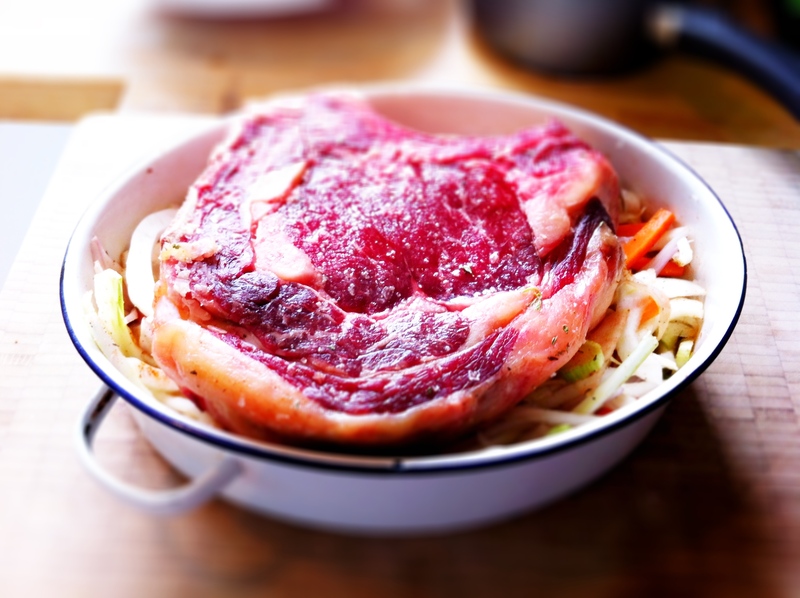 The bones hold all the flavour! This Easter it’s just been me and my husband last weekend. No friends, no visitors, just him, me and the cats for company. Sadly, it was a bit of a miserable weekend in terms of the weather, full of blustery, cold wind and the ever present drizzle – not enough rain to stop the hose pipe ban in the Southeast of England yet wet enough to put one off from leaving one’s house. It just leaves one feeling… meh. At times like this, I’m really grateful that I love cooking because the off putting weather means we just have to find our entertainment indoors, which for me means the kitchen. We opted to get a single rib of beef for Easter Sunday, thereby ensuring that we would have plenty of cold roast beef to put into sandwiches this week. 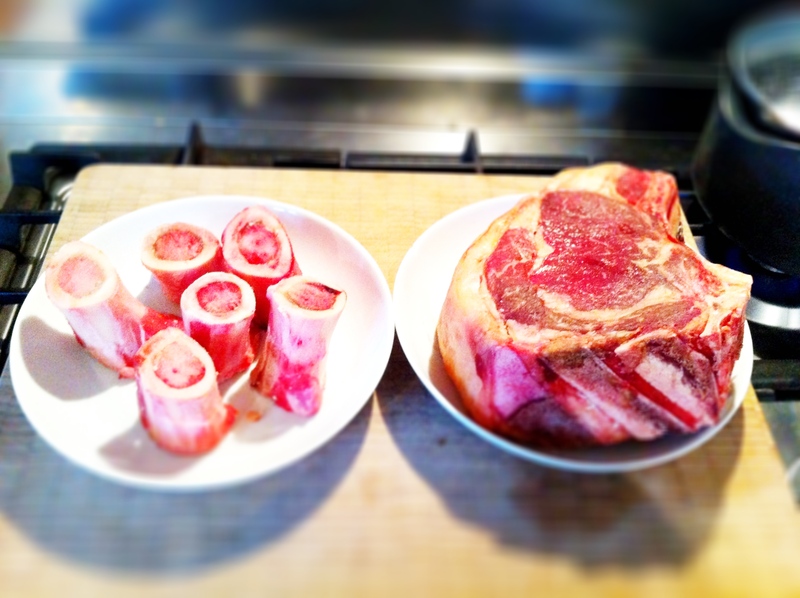 A single rib of beef and some veal marrow bones from our butcher. 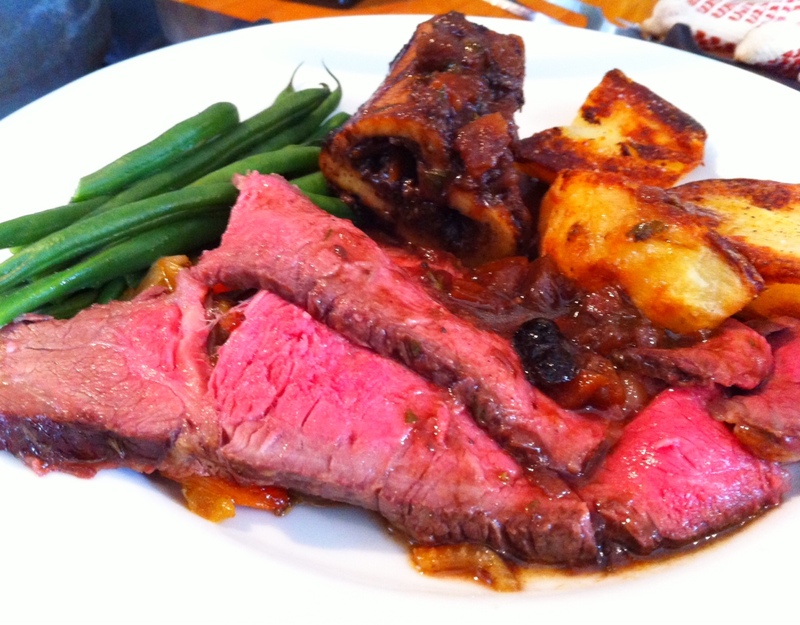 I’m not posting the recipe for the beef – this was simply roasted on a bed of fresh fennel, carrots, shallots and onions – but thought I’d share my bone marrow gravy today. We like our roast beef really pink and rare, so the meat itself is only roasted for 40 minutes and then allowed to rest for 30 minutes – the perfect amount of time to allow the vegetables its been sitting on to caramelise in the oven. I don’t think people use enough of a whole animal, and most butchers are happy to give you extra bones if you ask. 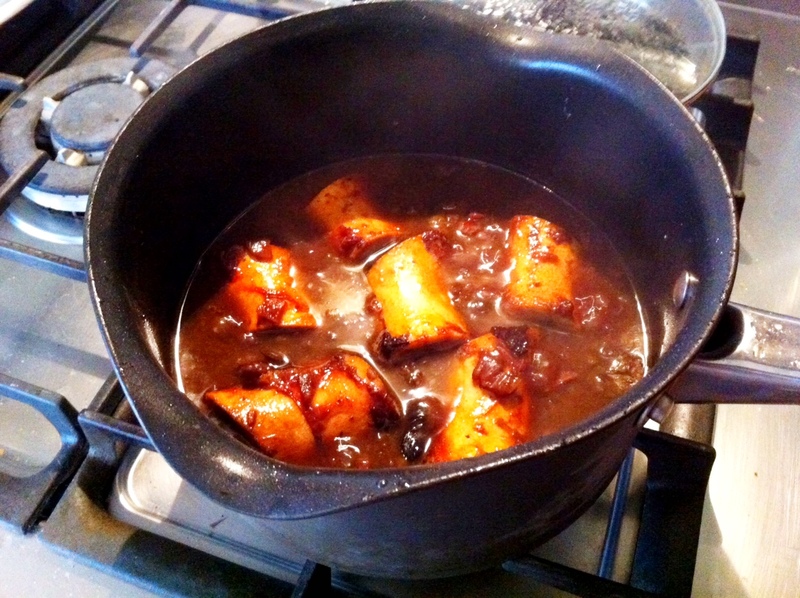 Our butcher gave us these veal bones, packed with marrow, which I simply roasted with some sea salt for the same amount of time before I dropped them into my gravy. This simple gravy is so easy to put together simply because I cheat by using a can of beef consommé instead of beef stock. Naturally, if you have beef stock to hand, by all means use that, but consommé is just convenient. Bone marrow gravy - made with beef consomme and lots of vegetables and a combo of red wine and port. It’s almost the weekend already (yay!) but wherever you are, I hope you’re having a good day. Start by sweating for the carrots, onion, shallots, ginger, garlic and celery under a low flame for 10 mins. Turn the heat back up and fry the vegetables until they start to brown. Add the beef/veal marrow bones and all the remaining ingredients, with 1 cup of water retained from boiled potatoes and simmer for 2 hours. I love everything about this meal. I normally cook a rib of beef sometime over the holidays, usually on New Year’s Day, and hope that it looks as good as yours. I’m new to cooking marrow and find it’s getting more and more expensive here. The cooking shows have “discovered” it and now more people are requesting bone marrow. Have I mentioned how much I abhor the laws of supply and demand? Be that as it may, yours was a real feast fitting for a holiday like for Easter Sunday. Well done! This looks so warm and comforting, BFN. I love Beef Marrow, but sadly it does not love me, way too rich. I had a portion at my favourite French Bistro in Toronto and felt so sick afterwards. My mom used to make it for us when we were kids. This sounds immense, I love proper gravy with a roast dinner. Noodle, that looks delicious. Its hard to fault bone marrow in this sort of thing – people may turn their noses up at it, but I don’t – it’s a simply wonderful ingredient. Ooh, that roast looks pink and delicious! Bone marrow is the nectar of the Gods. Delish! Yum, yum. Love marrow bones!